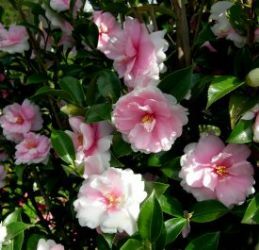 An exceptionally vigorous and free flowering Sasanqua Camellia, Dream Weaver™produces wave after wave of light blush pink to near white double flowers that darken to deep rosy pink at their base and retains a few yellow stamens. This Yume hybrid still retains some of the clefting on the ends of its petals like its parent. 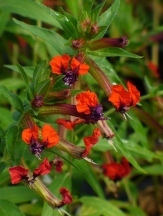 It begins flowering in October and continues well into December. Use Dream Weaver™ Sasanqua as a medium sized specimen, hedge, or low evergreen screen. 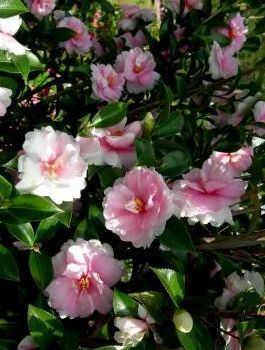 The small leaved Sasanqua Camellias make excellent landscape or container plants and are much more tolerant of sun and soil conditions than the larger flowered Japonica Camellias. 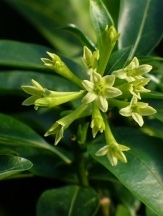 These durable evergreen shrubs cover themselves in 2-3" flowers in fall and early winter and before the flowers fade the petals fall individually to form a colorful blanket beneath the dark glossy green foliage. These dwarf Camellias are amenable to pruning and shearing which should be done in spring. Sasanquas do appreciate a humus-rich soil, an organic mulch, and average moisture until well-established. For more on growing Sasanqua Camellias read Dr. Allen Owings', an LSU AgCenter Horticulturist, article titled "Sasanquas, Dwarf Camellias Add Color to Early-Winter Landscapes". Or check out our Guide to Planting & Growing Camellias. 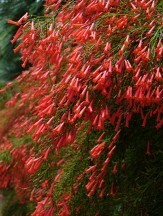 Images courtesy of Green Nurseries, all rights reserved. Soil & Moisture: Provide a humus-rich soil, an organic mulch, and average moisture until well-established. Dormant Shipping: Evergreen, though not in active top growth in winter.